Choosing Granite Countertops | Planet Marble Granite & Tile Inc. Choosing granite countertops can be a difficult decision when you don’t know enough about how the process works. Planet Marble and Granite will help walk you through the various steps and choices to consider when buying granite countertops. Granite countertops are a natural choice for kitchens due to their unique beauty and unequalled durability. Granite is scratch-resistant, rock-solid, drop-dead gorgeous. It is the preferred choice for hard-working indoor and outdoor kitchens as well as being a touch of luxury in your home. There is a bewildering array of granite countertops for sale – how to decide between them? Color – You want to choose a color that will be compatible with the décor of your home. There is a natural variation in the coloring, shades and streaking in granite since it is a natural stone. You can find granite that is solid, speckled or veined for just the look you want. 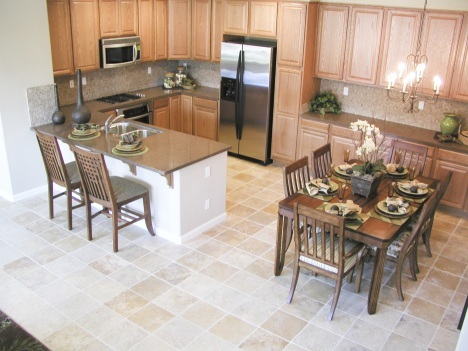 Every slab is unique and you can find a granite color and pattern that will complement the rest of your home. Thickness – Granite countertops generally come in two thicknesses, either 2 cm or 3 cm, that is ¾” or 1 ¼”. Keep these two sizes in mind when choosing granite countertops for your kitchen or bath. The thicker 1 ¼” granite will cost more and is heavier but due to its thickness it is able to span longer distances. The thinner ¾” granite will require supports for overhangs and laminated edges to build up the thickness of the granite edge. Edges – Choose the type of edge finish you would like. Many people buying granite countertops don’t realize that they can select the edge detail they would like on their counters. Planet Marble and Granite offers 5 standard types of edging on the granite and we are willing to consider any custom orders to match existing architectural details as well. Sink and Backsplash – You can decide if you would like a drop-in sink or an under-mounted sink. Planet Marble and Granite offers great deals on under mount sinks that flow seamlessly with your granite countertops. Your choices for a backsplash can range from granite that matches your countertops to using tile for your backsplash to using no backsplash at all. At Planet Marble and Granite we’re happy to help you look through the granite countertops for sale to bring you the best kitchen that’s just right for you. Feel free to bring in samples of your cabinets or flooring to match when choosing your granite countertops. Planet Marble and Granite can do the entire job for you, including cabinet installation and complete kitchen and bath remodels! Planet Marble and Granite specializes in helping the discerning homeowner in upgrading and transforming their kitchen or bath. We offer fast turnaround times and highly competitive prices for both residential and commercial applications as well as contractors. You can depend on us to meet your expectations with integrity and dedication. We understand the time constraints that contractors deal with and we can help with accurate time estimates and consistent quality in our fabrication and installation. The natural beauty of granite is matched by its superior strength and durability. Contact Planet Marble and Granite for more help choosing granite countertops that are perfect for you.